Hi everyone! Yay! 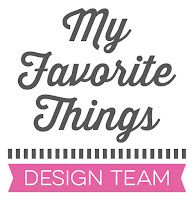 It’s time for the My Favorite Things September product launch! Today, you can see all new products and they are available right now on the MFT online store! For this project, I used the newest Sweet Celebration paper pack. I love the beautiful pastel colors. The clouds are from the Puffy Clouds die set. I blended them with Copic markers. The opening was die cut with the Jumbo Peek-a-Boo Circle Windows Die-namics. I colored the images with Copic markers and used the coordinating dies to cut them out. The sentiment is also from the Harvest Buddies stamp set. I die cut the tiny heart from Tickled Pink cardstock using the Hip Clips die set. Awesome card - love those adorable harvest buddies! Thanks for the inspiration all release launch long! Love this paper pack. That cutie is doing quite a balancing act. I'm nuts about this card! Super cute! Adorable card. Always love your coloring and designs. So cute. Your coloring is excellent, and I love your paper picks. So super cute! Thanks for the inspiration! This is freaking ADORABLE!!! Love him!!! The squirrel is so cute and I love the small gingham paper. This is so so cute! I am in awe of your coloring skills - amazing! Ohhhh Francine... I just bought some of the latest releases after seeing your hedgehog and llama cards... now I have to go back and buy this set!!!! It's just too cute. This card is perfection at its best. Love the layout, the balance in the patterns, the coloring is superb, and this critter has stolen my heart. Love it. Cheers! Really sweet and cute card. Love the pattern paper in the background. Too cute! Love this card. Wonderful card to introduce the new stamp set.....love you CAS design. Of course, your coloring is always eye catching. That squirrel is so cute! Lovely card. What better way is there than a cute squirrel with a load of acorns to show affection -great job! Totally adorable card. Fantastic colouring and I really like your design with the colourful checked window. Love this card design - and the new release is SO much fun! Beautiful coloring and adorable card!!! So beautifully coloured and a wonderful layout. I love the plaid DP you chose behind your adorable squirrel! I love how the squirrel is colored. Such a cute card! Absolutely adorable card. Love how you use the patterned papers. What is it about a critter and his acorns? Just stinking cute. Love all those little acorns in his arms. Adorable image and great copic coloring. I love, love, love this card, it is so cute!!! Adorable card. Love the cut out behind the cute squirrel. Your card is so cute! I hope Little Miss Squirrel can see over her pile of acorns or she's going to fall off that branch! Oh Noooo! LOVE this. Your coloring is fantastic and love your card layout. Simply beautiful!! Love all the bright colors you used! Can't wait to get those darling squirrels. Cute card. This comment is so adorable!!! Awesome card! Love the background! So, so cute! Love the coloring on your little squirrel. So cute. I like the circle frame and your coloring. What a cute card! I love all your coloring too! Love your background paper in the circle! Adorable card! Cute card! I like how you grounded the critter on the branch! Super cute card! Your papers and colors are so pretty together! Awww, those little fall critter with their acorns just make me smile inside and out! Super cute! You'll brighten someone's day with this beauty! Cute card! I love the Harvest Buddies set! What a sweet card. Love the patterned papers. Totally adorable and your coloring looks amazing! Darling card! Love it! Great paper choices and coloring too! This is such a cute card. I love the layering of dimensions. 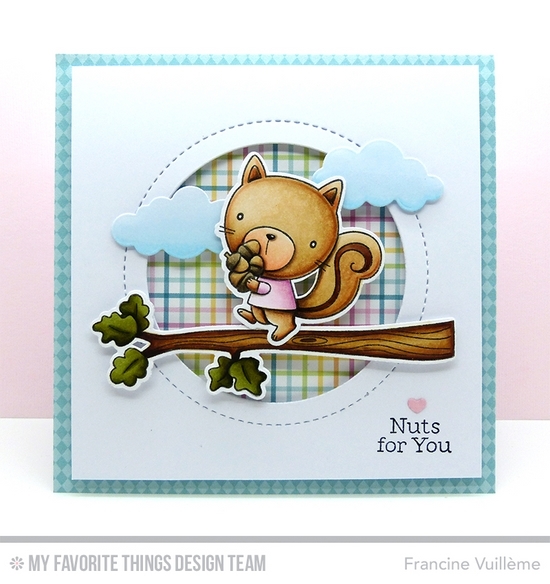 I am in love with this card Francine! Such a cute card! I love the patterned paper pack. This card is so sweet! I love the new paper you used in the background of this super cute card! Harvest Buddies are truly cuties! Wow! Such adorable card!!! Love it!!! Adorable image and great design with the plaid paper in the window. This couldn't be cuter, love it!! Love the way you colored the scene. It's really striking. that he is up in the clouds! Oh, I just LOVE this darling card, Francine! Your Copic coloring never ceases to amaze me...even on the clouds, it's just beautiful! I also love how you paired your patterned papers on this card...so pretty!